These words were one of the things that rang through with all the strength, determination, and resolute decisiveness that encapsulated Padmé Amidala in The Phantom Menace. From one delivery of this simple sentence, we know everything we need to know about Padmé. It’s funny how tiny things like that in a two hour long action-packed space opera can be the most powerful moment. From the plan she comes up with to retake her planet to the amazing amount of headshots on battle droids she nails, this moment is her most powerful. A simple sentence that I understood back in 1999. Apparently, I wasn’t the only one. In fact, there were those out there who understood Padmé far better than I ever could. The way E.K. Johnston understands her. She speaks in Amidala’s voice as if she was trained for years. 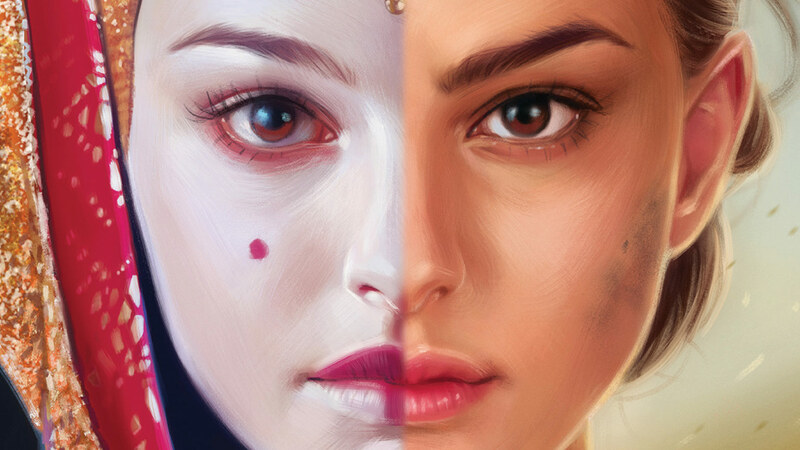 The book itself gives depth and insight into Padmé, Sabé, Dormé, Cordé, and Versé and many other Naboo… ians? Naboo.. uns? Naboo… ites? As Padme leaves her throne and adjusts to her newfound role of senator in her first year of appointment. Life of politics on Coruscant and learning to serve her planet on a galactic scale. The book is heavy on politics, intrigue, and Padmé dealing with the frustrations of trying to accomplish things in a system that makes action and decisiveness impossible. The story itself is not the swashbuckling blaster slinging adventure most of us think of when we think of Star Wars but it is closer to the political intrigue as seen in The Clone Wars episodes Senate Spy or Heroes on Both Sides. It’s a setting that finally lets us see Padme and her coterie doing what it is that they do. If you enjoyed Bloodline or Leia: Princess of Alderaan this book feels much closer to those stories. I listened to the audiobook version which was narrated by Catherine Taber who played Padmé Amidala in The Clone Wars animated series. It really makes a difference with a book like this. Anyone familiar with Padme over the course of the show will definitely feel right at home. I am always happy when a book like this casts the actor we are familiar with. Such as Ashley Eckstein for Ahsoka or Kelly Marie Tran in Cobalt Squadron. As Padmé changes from Queen to a senator, so too must her voice. She knows this and works to become as effective as she can learning the ropes of the galactic senate. But Amidala is more than a voice. It’s a persona, shaped and perfected to become what her planet needs. But Padmé doesn’t do it alone. In this book, we get to know her decoys, her protection, her loyal bodyguards. Her handmaidens. Elite, handpicked, skilled, and loyal. Seeing how they operate is mindblowing. As a unit. A squad. A team. A family. This is probably the most refreshing and interesting aspect that was full of awesome that I never considered. 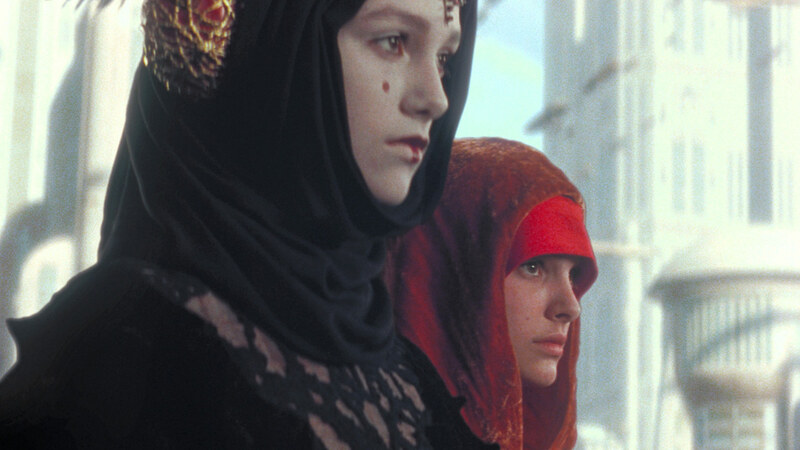 Each handmaiden is skilled or has a unique talent that serves Amidala. For example, Cordé became the best at doubling Padmé on Coruscant. Dormé was the one who took senator Amidala’s wardrobe and turned it into armor or concealed weapons when necessary. 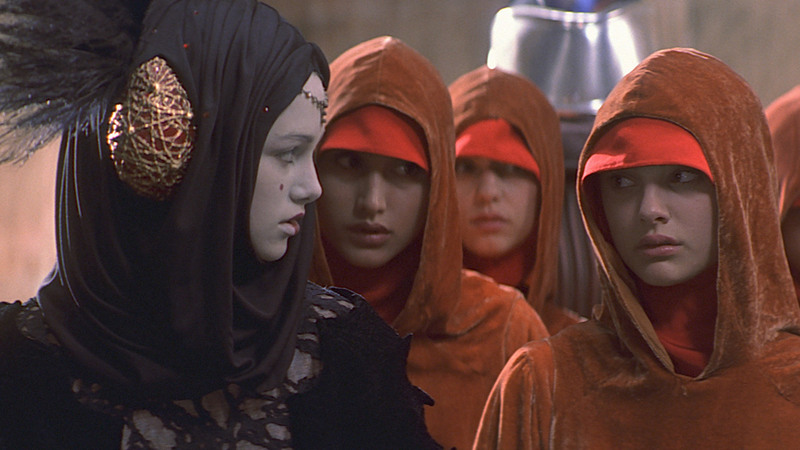 The idea that Padmés clothing was another form of protection is just the coolest idea ever. I mean, Karlini silk that protects you in a firefight? Hairpin lockpicks? Personal shield generators and signal jammers? I’m super jealous. But the real thing here is how much they all care for Padmé. Their unflinching friendship and loyalty. In such a pessimistic world it’s wonderful to see this team of friends doing everything they can to protect and support each other through difficult situations. In particular, the friendship between Padmé and Sabé is clearly deep and true. The planet of Coruscant is where most of the story takes place. But it’s nice to become more familiar with another side of it. It’s also wonderful to see familiar faces like Bail Organa, Mina Bonteri, Mon Mothma, and Onaconda Farr. Of course some of the characters we have become much more familiar with in other stories but this book gives us a look at them in a much more peaceful time. It’s also wonderful that there is a scene where Padmé visits Alderaan and Queen Breha. Considering the future connection of these two it’s a scene that I’m glad we needed to see. Sabé is entrusted with a mission to Tatooine to rescue the mother of the boy who helped Padmé during the Invasion of Naboo. Even though we know this mission is doomed it’s wonderful to see Padme never forgot about her. It takes a piece of the tapestry and gives it a nice closure. I also enjoy that it hints about her fate with the white sun etched into the former Skywalker dwelling. In the galactic scale, her final chapter in Revenge of the Sith is something we are all familiar with. But the epilogue here gives us a much more personal touch by showing us Sabé and her side of this particular story. It also throws a wild card into the canon that I had never considered before. For Padmés friends and loyal handmaidens, there would be questions. But for Sabé, she would find answers. This epilogue is one of the most compelling pieces of the story. Like the prologue, it’s disconnected from the main story but takes a familiar situation and sheds new light on it. And, like most Star Wars stories… it leaves us wanting more. As a fan of pretty much everything Star Wars, I love when they drop in things that connect to other media that I appreciate. In this book, there are some good ones. The ion pulse defensive weapon is being built which will later be used during Operation Cinder. I already mentioned Mina Bonteri and Uncle Ono but fans of The Clone Wars will also recognize Rush Clovis. Trinebulon News is a great way to pop in the constant media spin, even in a galaxy far away. Supreme Chancellor Palpatine and how he deals with his planet’s aggressive senator. The lake country retreat. Padmés Japor Snippet and the search for Shmi are strong connections to her early actions as a fledgling queen. Panaka’s Imperial appointment and a bit more understanding of Queen elections and term limits. A familiar diner on Coruscant seems to be everyone’s meeting place. Mina Bonteri’s secret contact. Depa Billaba who Padmé met at the funeral of Qui-Gon Jinn. Padmés work, some left unfinished is also one of the most heartbreaking pieces of the puzzle. It makes clear how important it was for her to help people. Unfinished proposals to give Clones human rights and a proposal on abolishing slavery it’s clear to see the things that drove her until the very end. It’s clear Johnston was the right choice for this story. I now believe she has been a SECRET HANDMAIDEN ALL THIS TIME. As a costumer, I love reading descriptions of wonderful new Padmé costumes I hope to see in the future. It’s definitely not full of blaster fire and lightsabers but it builds on Padmés character, the political system of the Republic, and the looming problems that lead to the formation of the Separatists. “Evil? I’ve fought evil and it was easy: I shot it.